Home / aws / aws cli / Want to be AWS Certified Developer Associate? You should know this! you are on the right place to know some basic understanding regarding AWS Associate Developer certification. There are some other AWS certifications available other than Associate Certified Developer like Foundational, Associate and Professional certification provided by AWS. You can skip below four informations(1 to 4), if you are not willing to know about other AWS certifications. 1: Foundational Certifications: It include 'AWS Certified Cloud Practitioner' certification which is optional certification not required for other advanced certifications like Associate, Professional & Specialty. 3: Professional Certifications: It includes AWS Certified 'Solutions Architect Professional', 'DevOps Engineer Professional' & 'SysOps Administrator Professional' certifications but please note you must passed relevant associate certification before starting Professional Certification. but it require at least one active Foundational, Associate or Professional Certification. Lets talk about AWS Certified Developer Associate certification. You should have experience with developing and maintaining applications written for Amazon Simple Storage Service, Amazon DynamoDB, Amazon Simple Queue Service, Amazon Simple Notification Service, Amazon Simple Workflow Service, AWS Elastic Beanstalk, and AWS CloudFormation. 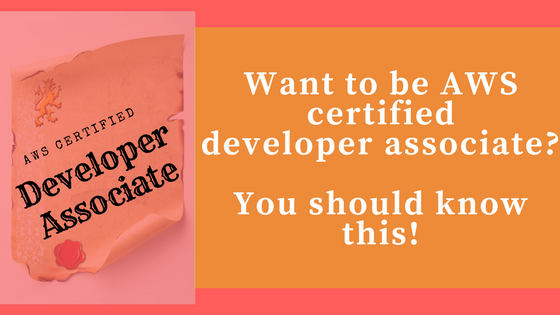 If you want to read more details then click on link https://aws.amazon.com/certification/certified-developer-associate/ which will navigate you on AWS Associate Certified Developer documentation page.